We are writing to you to inform you about current situation in Myanmar and the reality on the ground from the perspective of young people. Allow us to get straight to what we want you to know. 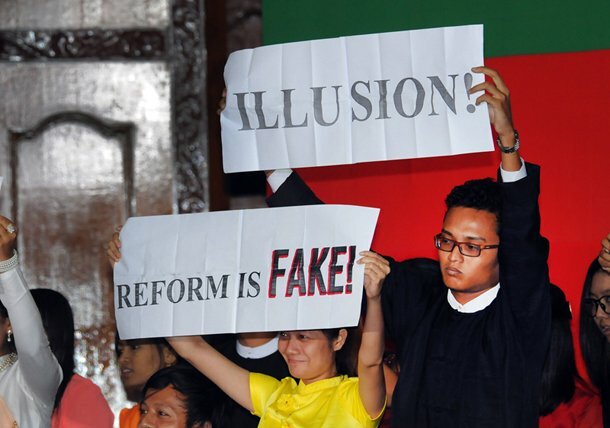 Current reform in Myanmar is fake. Changes that have happened are cosmetic to please the international community to attract investments to get the old regime out of economic isolation. We do not believe this reform process is going to take us anywhere because the motivation for reform is insincere. We want genuine democracy and national reconciliation. Almost 4 years ago when the military regime made a sudden decision to undertake reform, many people and actors particularly the international community believed it was the end of military rule, so were we as young people. Parliaments were established and new nominally civilian government was inaugurated. However new political landscape has brought new challenges that never before we have seen. Land confiscation is widespread as the government makes way for investments. Political prisoners were released but many remain behind bars and many more are being arrested and facing charges. Oppressive laws are still in place and new laws are being regulated amid numerous objections by the people and civil societies. These laws are threatening reform process and intimidating us. Ceasefire process is facing a deadlock with no side willing to compromise. Meanwhile thousands of people in IDP camps who have fled fighting in Kachin State and Northern Shan State, this year, have received less than half of the aids and assistance that used to be provided to them. Religious tensions and communal violence throughout the country and particularly in Arakan State, and we believe they have been largely driven by incitements of people who seek political benefit and who are waiting to pull the trigger at time of crisis. Institutionally, all we gain was a new political landscape and improved media freedom. There is no educational reform and security sector reform, There is no guarantee for a free and fair election in 2015. Chances of amending the 2008 constitution are invisible. Meanwhile the military is too powerful, untouchable, and enjoying the deep-rooted impunity. All these unreformed institutions are still serving the interests of the old regime and ensuring that they remain in absolute power, or even strengthen their power by means of economic gains through new investment opportunities. Indeed, the only change we see institutionally is the opening up of investment and aids that primarily benefit regime of old time. Today they are still in power and they are still in Business. After more than 60 years of struggle and sacrifices, this is all that was given to us and there is no sign or indication that this situation is going to improve unless we stop praising the government and start talking about the reality. The Lady, DawAung San SuuKyi warned that your administration may be is being “overly optimistic” about the situation. Likewise, The UN Special Rapporteur on the situation of human rights in Myanmar, Ms. Yanghee Lee warned at the 69th UN General Assembly of “signs of possible backtracking”. For people like us who are dealing with this broken system on the ground on a daily basis, we feel far worse than that. Therefore we would like you, Mr. President, to support the people’s struggle at this time like you always had during the time of hardship under military dictator in the past. We urge you and your administration to stop praising the government and start speaking out effectively about the remaining issues and take concrete measures that reflect the crisis that we are facing. We also urge you to put human rights and democracy first before other interests in your engagement with the government. Finally, we urge you and your administration to increase supports and assistance to the struggle of people, civil society and youth operating on the ground. We are a group of young people who with diverse background who are committed to achieving a genuine social and democratic change, human rights, equality and justices in Myanmar. We are students, activists, community social workers, and member of local and regional Non-Governmental Organizations. 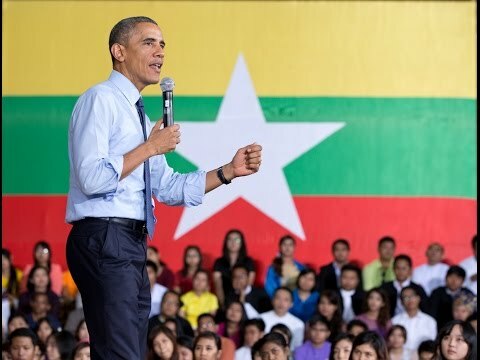 PRESIDENT OBAMA: Myanmar Luu Ngae Myar Min Galarbar! (Applause.) It’s wonderful to be back in Myanmar. Everybody, please have a seat. Have a seat. Oh, we got some signs — “Reform is fake.” “Change…” — okay, well, you guys will have a chance to ask questions later. Yeah, you can put them away. That’s why we’re here — for a town hall. See, that’s the thing, when you have a town hall, you don’t have a protest because you can just ask the questions directly. Two years ago, I was the first American President to visit this country, and I was deeply moved by the generous hospitality that greeted us here, and the sight of children waving the flags of both of our nations. And I was inspired by the incredible diversity and culture, and the various religious sites from different faiths and communities. And I was inspired again today, when I had the opportunity to visit the Secretariat — the birthplace of modern Burma; the blueprint for democracy; a home to Burmese, Chinese, Indians, Buddhists, Muslims, Hindus, and Christians who lived together peacefully — an incredible example of multicultural and multi-faith diversity and tolerance. And it’s a profound symbol of this country’s rich diversity and this region’s potential. Whenever I travel the world, from Europe to Africa, South America to Southeast Asia, one of the things I most enjoy doing is meeting young men and women like you. It’s more fun than being in a conference room. And it’s also more important — because you are the young leaders who will determine the future of this country and this region. So I’m going to keep my remarks short at the top, because I want to take as many questions and comments from you. 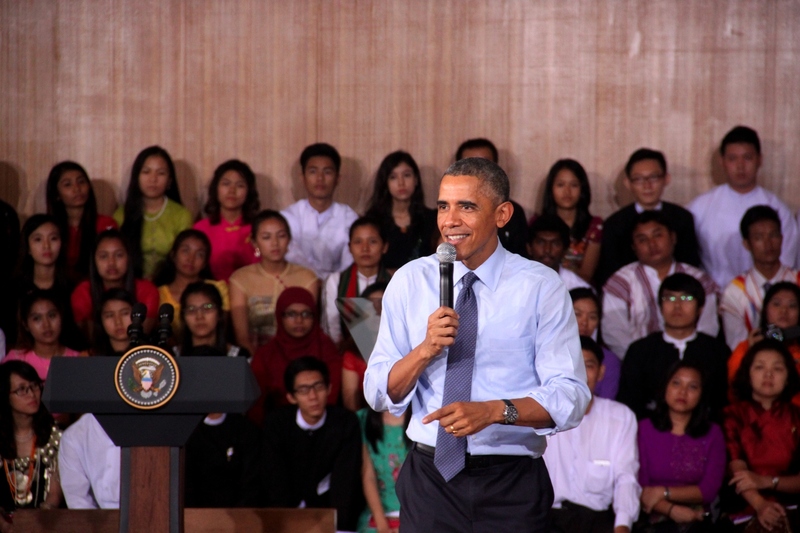 As President of the United States, I’ve made it a priority to deepen America’s ties with Southeast Asia — in particular, with the young people of Southeast Asia. And I do this for reasons that go beyond the fact that I spent some of my childhood in Southeast Asia, in Indonesia. And that gives me a special attachment, a special feeling for Southeast Asia and this region. But I do it mainly because the 10 nations of ASEAN are home to about one in ten of the world’s citizens. About two-thirds of Southeast Asia’s population is under 35 years old. So this region — a region of growing economies and emerging democracies, and a vibrant diversity that includes oceans and islands, and jungles and cities, and Peoples of different races and religions and beliefs — this region will shape the 21st century. And that’s why I launched the Young Southeast Asian Leaders Initiative — to deepen America’s engagement with the next generation of leaders in government and civil society, in education and in entrepreneurship. And more than 10,000 young leaders like you have joined this Young Southeast Asian Leaders Initiative network, working to solve the challenges and seize the opportunities of this dynamic region in a spirit of mutual cooperation and respect. So earlier this year, I held a town hall just like this one, in Malaysia. And today, I’d like to take our next steps together with you. When I took office nearly six years ago, I said the United States would extend our hand to any nation willing to unclench its fist. And here, after decades of authoritarian rule, we’ve begun to see significant progress in just a few years. There is more of a sense of hope in Myanmar, that was once so closed to the world, about the role that it can now play in the region and in the world. But we know that a journey to progress is not completed overnight. There are setbacks and false starts, and sometimes even reverses. And that was true in America during our 238-year history. It’s happened here in the past two or three years. We’ve seen some progress, and we should acknowledge that progress. We also know, though, that despite the fact that political prisoners have been released and people are more engaged in political dialogue, there’s a parliament and civil society is emerging — despite all that, some reforms have not come quickly enough. There are still attacks against journalists and against ethnic minorities. America is still deeply concerned about the humanitarian situation in Rakhine state, and the treatment of minorities who endure discrimination and abuse. On this visit, I’ve met separately with President Thein Sein and Daw Aung San Suu Kyi, as well as members of parliament, and civil society leaders. And we discussed key reforms that have to be made to ensure that human rights and freedoms are respected, and the people of this country can reach for their rightful place in the region and the world. And I was also proud to announce that the Peace Corps will come here, to Myanmar, to deepen the ties between our people. 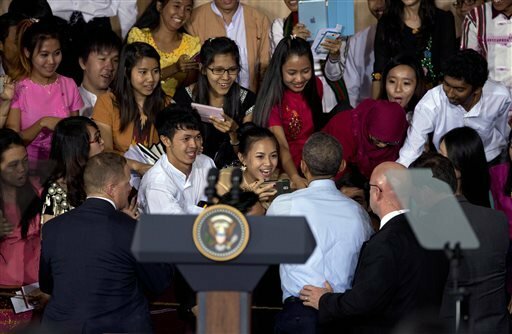 It gives an extraordinary opportunity for young Americans to interact with young people here in Myanmar. And that people-to-people exchange is often as important or more important as government-to-government exchanges. So progress is not inevitable. History does not always march forward. History can travel sideways and sometimes backwards. Building trust after years of conflict takes time. Being able to look past the scars of violence takes courage. Securing the gains of freedom and democracy requires good faith and strength of will, and tolerance and respect for diversity, and it requires vigilance from all citizens. The American people know well that rights and freedoms are not given; they have to be won through struggle and through discipline, and persistence and faith. And it’s often young people who have led these struggles; who have compelled us to slowly but surely perfect our own union in America over time. And America is committed to helping the young people of this nation and this region climb until you reach the top. We believe in this nation. That’s why I’ve come and visited twice in the last few years, because we see a future where democratic institutions can be accountable and responsive; where political activists are free; where elections are fair; where journalists can pursue the truth; where ethnic minorities can live without fear. So we’re betting on this country, but we’re also betting on this region, because we see young people of different nations and religions and ethnicities who are eager to come together and address all the challenges that are out there: environmental protection; human rights; improving education; combating poverty; advocating for a greater role for women in business, in government and in society; increasing resilience in the face of natural disasters; spurring economic progress so more young people can follow in your footsteps and get a good education and have opportunity. We see young leaders who embrace the diversity of this region not as a weakness, but as a strength, and who realize that even though we are all individually different and come from different traditions and different communities, we’re stronger when we work together. So the future of this region, your region, is not going to be determined by dictators or by armies, it’s going to be determined by entrepreneurs and inventors and dreamers and people who are doing things in the community. And you’re going to be the leaders who make that happen. Your generation has greater potential to shape society than any generation that’s come before because you have the power to get knowledge from everywhere, and you have more sophistication and experiences than your parents or your grandparents. And you have now the chance to share knowledge and experiences with other young people all across this region and around the world. And that wasn’t true 20 years ago or 50 years ago. La Min Oo uses his power to tell the story of his fellow Burmese. He studied at Gettysburg College in the United States. The transformation that he watched unfold through Facebook inspired him to return home and make an award-winning documentary about the plight of Burmese farmers. And he says, “My country has been closed so long, there are a lot of stories to be told.” So you young people have the chance to say — to tell those stories. You have the power to improve institutions that are very important for democratic governance, like civil society, and an impartial judicial, and a free press, and private enterprise. And there’s so much to build here. In countries like this, it’s critical that you get involved in that way. I’ll give you an example. Ryan Louis Madrid dreamt of being a journalist. But as he stood surrounded by the wreckage of a typhoon in his beloved Philippines, he made himself into an instrument for his fellow citizens rebuilding. Today the organization he co-founded puts solar rooftops in developing and recovering communities. And he wants to use his skills to encourage other enterprising young people in developing countries to say in their countries and help their own people, to think globally and act locally. You have the power to remind us all that human dignity is not just a universal aspiration, but a human right. You have the chance to overcome hatred and make sure that freedom rather than repression, hope rather than fear is governing your country. You have the power to set your own countries on a new and different path. And in all of this, America wants to be your partner. We want to help any way that we can to help you shape your future. We want you to have the tools and the connections and the resources that you need to change the world. So one way that we can do this, I’m announcing a significant expansion of the Young Southeast Asian Leaders Initiative Fellowship, an exchange program that will bring 500 Southeast Asian leaders to the United States every year. And these fellows will have the chance to strengthen their professional leadership skills, network with one another, share experiences and ideas, and then come back home better prepared to lead your region and change the world. So some of these fellows will benefit from five-week instruction at some of the best universities in America on issues like entrepreneurship and environmental stewardship and civil society and human rights. Others will have the chance to work in professional fellowships at state and local governments and NGOs across the United States. And, by the way, through this program that I hope some of you will be able to take advantage of, when you spend time in the United States our people learn from you. So it’s not just you learning from us. And when these fellows then return home with these new ideas and new experiences, our embassies and USAID missions will reach out and offer the support and resources to help make your dreams a reality. So today I’m proud to announce that America will convene a young Southeast Asian Leaders Initiative Summit in this region every year, giving fellows the chance to share their successes with each other and strengthen their network to accomplish even more. So I hope some of you will take advantage of this. I expect many of you will take up the mantle of reform from student activists like Aung San Suu Kyi and Min Ko Naing; take your rightful place as leaders in a stable and prosperous and progressive Southeast Asia. And as you do, I promise you will have no better friend and partner than the United States of America. Okay, so there should be — I’ve got a microphone, and there should be mics in the audience. And I’ll take as many questions as I can before I have to go to Australia. All right, who wants to go first? This young man right here. Q I’m (inaudible.) I’m a third-year student, majoring in English at Sittwe University, Rakhine state, or as you would say, Rakhine state. Q I’ve experienced some sectarian and racial balance firsthand in my region. So the question I would like to ask you to answer is: How can I be part of educating my generation to promote tolerance and respect cultural differences, and most of all, eradicate extremism among different ethnic groups? PRESIDENT OBAMA: That’s a great question. Thank you so much. I had a chance to meet with some civil society groups, and I had a press conference earlier today. Yesterday, I had a chance to meet with parliamentarians, including the speaker — the two speakers, as well as Aung San Suu Kyi, and then spoke with the President. And to all of them, I said this: There is no example of a country that is successful if its people are divided based on religion or ethnicity. If you look at the Middle East right now and the chaos that’s taking place in a place like Syria, so much of that is based on religious differences. Even though they’re all Muslim, Shia and Sunni are fighting each other. If you look in Northern Ireland, then Catholics and Protestants fought for decades and only now have arrived at peace. So in this globalized world where people of different faiths and cultures and races are going to meet each other inevitably — because nobody just lives in a village anymore; people are constantly getting information from different places and new ideas and meeting people who are different from them –- it is critical for any country to abide by the basic principle that all people are equal, all people are deserving of respect, all people are equal under the law, all people can participate in the life of their country, all people should be able to express their views without fear of being repressed. And those attitudes start with each of us individually. It’s important that government play a role in making sure that it applies laws fairly, not arbitrarily, not on the basis of preferring one group over another. But what’s also true is that each of us have to cultivate an attitude of tolerance and mutual respect. And for young people, we have to try to encourage each other to be tolerant and respectful. So in the United States, obviously one of the biggest problems historically has been the issue of racial discrimination. And part of our efforts to overcome racial discrimination involve passing laws like the Civil Rights Law and the Voting Rights Law, and that required marches and protests and Dr. King. But part of the effort was also people changing the hearts and minds, and realizing that just because somebody doesn’t look like me doesn’t mean that they’re not worthy of respect. And when you’re growing up and you saw a friend of yours call somebody by a derogatory name, a rude name because they were different, it’s your job to say to that person, actually, that’s not the right way to think. If you are Christian and you have a friend who says I hate Muslims, then it’s up to you to say to that friend, you know what, I don’t believe in that; I think that’s the wrong attitude, I think we have to be respectful of the Muslim population. If you’re Buddhist and you say — you hear somebody in your group say I want to treat a Hindu differently, it’s your job to speak out. So the most important thing I think is for you to, in whatever circle of influence you have, speak out on behalf of tolerance and diversity and respect. If you are quiet, then the people who are intolerant, they’ll own the stage and they’ll set the terms of the debate. And one of the things that leadership requires is saying things even when it’s uncomfortable, even when it’s unpopular — especially when it’s unpopular. So I hope that as you get more influence, you’ll continue to speak out on behalf of these values. The young lady in the yellow, right there, who had her hand up. Okay, hold on so we can get a microphone. Q I am (inaudible). I am Kachin and Burmese. I would like to ask about the ASEAN affair. So my question is, there are different political system and different level of democratic freedom in ASEAN. Do you think those differences will cost challenges to ASEAN integration? And do you believe it is the right time to push for ASEAN integration? Thank you. PRESIDENT OBAMA: Of the 10 countries in ASEAN, I just had a chance to meet with all their leaders at the U.S.-ASEAN Summit. And the good news is that ASEAN has become more ambitious over the last several years in trying to promote integration, to work together on issues like disaster relief or public health or maritime security or improved education. And I think it’s inevitable that integration is going to happen more and more. And my hope is that by encouraging integration, that the countries who are doing better on issues like democracy and human rights have a positive influence in bringing up those countries that don’t have such a good record. And we’ve actually I think seen that happen. Listen, when I first came into office, Myanmar was still very much a dictatorship. And there was some controversy about me participating in an ASEAN Summit because there was still no freedom in Myanmar. And I think that President Thein Sein, because he was with leaders like SBY of Indonesia — (applause) — see there, all right, the Indonesians started cheering — who had traveled the path of democracy, I think President Thein Sein began to see how more open societies were becoming more successful, and I think had a positive influence on — I think his participation in ASEAN had a positive influence in providing an opening to begin the process of transition here in Myanmar. But it’s important I think that even as we engage with countries that are less open or less democratic, that we also continue to apply constructive criticism where they fall backwards, where they fall short. And sometimes that’s hard to do. I think a lot of the leaders of ASEAN don’t like to criticize each other because they think that it’s not respectful. And no country is perfect, so they worry that if we criticize one country then somebody will criticize us. But I think the goal should be for all of us to try to improve what we do on behalf of our people every single day. I’m very proud of the United States. I believe that the United States is a force for good around the world. But I wouldn’t be a good President if I don’t listen to criticism of our policies and stay open to what other countries say about us. Sometimes I think those criticisms are unfair. Sometimes I think people like to complain about the United States because we’re doing too much. Sometimes they complain because they’re doing too little. Every problem around the world, why isn’t the United States doing something about it. Sometimes there are countries that don’t take responsibility for themselves and they want us to fix it. And then when we do try to fix it, they say why are you meddling in our affairs. Yes, it’s kind of frustrating sometimes. But the fact that we are getting these criticisms means that we’re constantly thinking, okay, is this how we should apply this policy? Are we doing the right thing when we provide aid to a country, but the country is still ruled by a small elite and maybe it’s not getting down to the people? Are we doing the right thing when we engage in training a military to become more professional, but maybe the military is still engaging in repressive activity? If we’re not open to those criticisms, then we won’t get better, we won’t improve. And I think all of us should be interested in trying to get better, because none of us are perfect and no country is perfect. So I do think ASEAN has an opportunity to play a very important role. But integration is inevitable just because of the nature of economies today. There’s too much travel, there’s too much Internet, there are too many smartphones. When I was driving through here, everybody had a smart phone. I saw a bunch of people — they didn’t have any shirt, but they had a smartphone. So what that means is — and most manufacturing today of various products, the parts are made in, like, five different countries, and then they become integrated in some fashion. And then they’re sold all around the world. So integration is going to happen no matter what. The question is, do we integrate at a high level that improves freedom and improves opportunity, or are we integrating at a low-level, where there’s less freedom and less opportunity. And I believe integrating at a high level, and I hope most members of ASEAN do also. All right, it’s a guy’s turn now. I don’t want to discriminate against the men. This gentleman right here. Yes, with the mustache and the beard. There you go. There’s a microphone coming right here. You can just stay where you are. Careful. Hold on to her, so she doesn’t fall. PRESIDENT OBAMA: Well, let me just say, you’re always popular in somebody else’s country. (Laughter.) When you’re in your own country, everybody is complaining. I think you’re right, Myanmar has so many challenges. I think the most important challenge right now is completing the transition to democracy. And so my first focus is I think the focus that many people have already talked about. Number one, there needs to be an election next year. It shouldn’t be delayed. Number two, there should be constitutional amendments that ensure a transition over time to a fully civilian government. Number three, there needs to be laws put in place to protect freedom of the press, freedom of expression, freedom to politically organize. And I think that if that process is fixed and institutionalized and made permanent, and you now have the tools to deal with all the other challenges, and I think that inevitably what would happen if you had a genuine democracy in Myanmar is the focus next would then be on providing economic opportunity, because Myanmar is still a very poor country. And what we know in the 21st century is, is that the most important tools for economic opportunity are making sure that young people are getting a good education. And my understanding is, is that the education system in Myanmar is still under-developed. I think all of you represent the best of Myanmar’s students. But my understanding is there are many villages you go to where there’s really no schools, as a practical matter, and many of the schools still teach just how to memorize certain things rather than how to think critically about problems. And every country at this point, if it wants to succeed, needs to put in place free, compulsory education for its young people — because they just can’t succeed unless they have some basic skills. They have to be able to read. They have to be able to do mathematics. They have to have some familiarity with computers. They have to be able to understand basic principles of science. If you don’t have those basic tools, then it’s very hard to find a decent job in today’s economy. Now, because Myanmar is still very agricultural, I think issues of land reform and trying to increase productivity in the agricultural sector is also a very immediate and urgent problem. This is true not just in Myanmar; this is true in many relatively poor countries. In Africa, for example, we initiated something called Feed the Future, and the whole goal is to improve the productivity of farmers. And farmers in many poor countries, they still use the same techniques that they used 200 years ago. They’re still using a buffalo or an ox, and waiting on the rains. And sometimes the new techniques, they’re not necessarily expensive; it’s just a matter of applying them scientifically. And if you double yields for a farm and double income for farmers in a country like Myanmar, suddenly you have increased wealth, which means that some people now can start businesses. Maybe now somebody can take some of the profits they made and invest in a tractor, or they can start processing the rice that they produce so that they can gain more value. Or they may be able to buy a smartphone so they know what the prices are in the market, and not get taken advantage of. So just small changes are really important. Now, my understanding, and I’m not expert, is that some of that will also require some reforms in terms of land ownership and leasing so that people can keep the products of their labor, as opposed to just being essentially what we call sharecroppers in the United States, where you’re working the land, but you’re giving it over to somebody else and never getting ahead. So those are just two examples of things that I think will happen naturally if you’ve got a democratic system in place. All right, it’s a young lady’s turn. So this young lady in the glasses right here. She’s waving very hard, so she must have an excellent question. Q Good morning. My name is (inaudible). PRESIDENT OBAMA: It’s afternoon, though. (Laughter.) Maybe you’ve been waiting here since morning. (Laughter.) But now it’s the afternoon. Q But you can call me Amy (ph). I want to ask one question. My question is, now we are working on IT, so America is already doubled up in IT. So can you provide any development center of IT and job opportunity for youth? 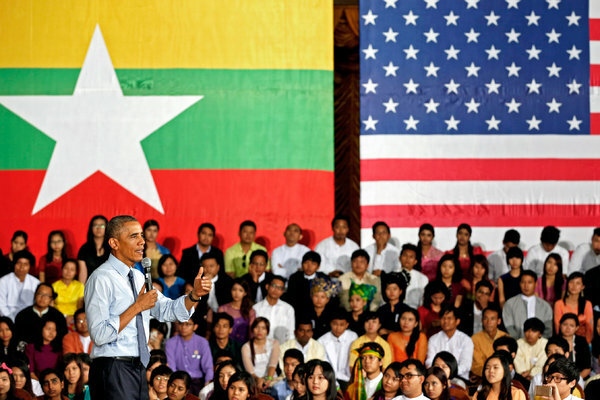 PRESIDENT OBAMA: Well, I was just talking to the civil society groups, and there was one person there who mentioned that Internet penetration in Myanmar is still only about 9 percent, which means there’s enormous room for growth. The issue for IT in a country like Myanmar is, first of all, setting up the infrastructure — whether it’s wireless or other methods — so that people can start communicating. And once the hardware is in place, then where the real development happens is in the software. And that’s where it’s really a matter of education, training, and developing a homegrown capacity. And so what we’ll do is we’ll work with both civil society groups, as well as the government, to find opportunities where we can promote the building of the infrastructure that’s required. But what’s really required is also making sure that young people are trained. And part of what’s going to have to happen is, in the United States most of the IT development happened through the private sector. Government invested in research, and so the idea of the Internet was developed with the help of government funding. But what became then the World Wide Web and then all the applications and social media and all that was really developed through the private sector. So part of what has to happen once democracy is installed in Myanmar is then also looking at how are you structuring laws to encourage innovation and entrepreneurship. So, for example, one of the debates that we’re having in trade negotiations with Asian countries in the Trans-Pacific Partnership, the big trade initiative that we’re moving forward, is the need to protect intellectual property. If you invent a better tractor, then in the United States, you go to a patent office and you register your patent. You show that this is a new invention. And if anybody then wants to produce this new tractor, they have to pay you for using your idea. The same is true for intellectual property. If you come up with the idea of Facebook, then you need to be able to get a benefit from this idea. And one of the problems I think that you still have in many countries in Southeast Asia and around the world is weak intellectual property protections, which means that if you’re an entrepreneur with a good idea, you don’t want to start your business here, because next thing you know somebody steals your idea and they just start their business. So you’d rather start the idea in the United States where you know that it will be protected. And then maybe you will lease to other countries, but the jobs and the opportunities will have been created someplace else. So setting up regulatory structures, protections for intellectual property, all those things are also going to be very important in order to get a strong IT culture and an innovation culture here in Myanmar and throughout the region. Q Yes, yes, just want to give you a kind of sheet, cheat sheet. PRESIDENT OBAMA: There you go. All right. Q I have only one question. PRESIDENT OBAMA: Why don’t you just ask me one of them? I’ll read the rest. Q My question, as you know — may I know your opinion about like how to create national identity, or like Myanmar identity — different, strong identity in our country? PRESIDENT OBAMA: Yes. That’s a great question. Yes, I was talking about this with the civil society groups because we are very supportive of the efforts to get a ceasefire and a peace process with the ethnic groups that have been engaged in armed conflict for a long time. And we’ve already talked about some of the problems that the Muslim populations have faced in Rakhine state. But what I said to the civil society groups is, yes, it is important to protect specific ethnic groups from discrimination. And it is natural in a democracy that ethnic groups organize among themselves to be heard in the halls of power. So in the United States, for example, as its democracy developed, the Irish in big cities, they came together and they built organizations, and they were able to promote the interests of Irish Americans. And African Americans, when they were seeking their freedom, you had organizations like the NAACP that promoted the interests of African Americans. So there’s nothing wrong with groups organizing around ethnic identity, or around economic interests, or around regional concerns. That’s how a democracy naturally works. You get with people who agree with you or who are like you to make sure that your concerns are heard. But what I said is that it is important for a democracy that people’s identities are also a national identity. If you walk down the streets of New York City, you will see people looking more different than this group right here. You’ll see blue-eyed, blonde people. You’ll see dark-skinned, black people. You’ll see Asians. You’ll see Muslims. You’ll see — but if you ask any of those people, “What are you?” — I’m American. Now I may be an African American or an Asian American or an Irish American, but the first thing I’ll say is, I’m an American. And if you don’t have that sense of national unity, then it’s very hard for a country to succeed — particularly a small country like Myanmar. If people think in terms of ethnic identity before national identity, then I think over time the country will start breaking apart and democracy will not work. So there has to be a sense of common purpose. But that’s not an excuse then for majority groups to say, don’t complain, to ethnic minorities — because the ethnic minorities may have some real complaints. And part of what is important for the majority groups to do — if, in fact, you have a national identity, that means that you’ve got to be concerned with a minority also because it reflects badly on your country if somebody from a minority group is not being treated fairly. America could not live up to its potential until it treated its black citizens fairly. That’s just a fact, that that was a stain on America when an entire group of people couldn’t vote, or didn’t have legal protections. Because it made all the Declarations of Independence and Constitution and rule of law, it made that seem like an illusion. And so when the Civil Rights Movement happened in the United States, that wasn’t just a victory for African Americans, that was a victory for America because what it showed was that the whole country was going to be concerned about everybody, not just about some people. And it was a victory for America’s national identity that it was treating minorities fairly. And that’s I think how every country in ASEAN, including Myanmar, needs to think about these problems. You need to respect people’s differences. You need to be attentive to the grievances of minorities that may be discriminated against. But both the majority and the minority, the powerful and the powerless, also have to have a sense of national identity in order to be successful. I got time for two more questions. Two more. He said one, but I’m going to take two. What did you win with? Were you scissors or rock? Were you rock or scissors or paper? Q Mingalaba, Mr. President. I am from Burma from (inaudible) in American Center. Right now we’re working on a documentary on Yangon University, Congregation Hall where you spoke the last time you came. PRESIDENT OBAMA: Yes, last time I was here. Q Yes. So as you know, Yangon University has reopened last year, 2013. So do think it is a good start to rebuild the higher education system in Burma? PRESIDENT OBAMA: Well, I think it’s a great start. But I think — as I said before, one of the biggest challenges Myanmar is going to face is rebuilding its education system. And I think it has to start early. It has to start from the youngest ages. One of the things that we’ve learned from science is that the most that you will ever learn in your entire life happens from the time you’re born until you’re three years old. Between your birth and the age of three, that’s when your brain is developing the most. And what we’ve learned, for example, is that when you read — when parents read to young children even before the children know how to read, the children are building a vocabulary that will put them in a strong position then to learn how to read later on because they’ve heard the words over and over again. And so I just make that point because it shows that if you’re only worried about university education, but you’re not worrying about what happens to children when they’re three, four, five, six years old, then you’re missing the foundation for a good education system. And this is true in the United States, as well. We’ve got the best university system in the world. Obviously I’m biased because I’m the President of the United States, so I think everything in the United States is the best in the world. But I think anybody objectively would say that we have a system of universities and colleges that is unequaled anyplace else. But we still have problems. And one of the things that I’m spending a lot of time on reform is the elementary, secondary school levels. And also, even earlier having what we call early childhood education to get children off to a good start so that by the time they go to school, they already know their alphabet and they can already start reading at an early age. And I hope that that ends up being a basic emphasis here in Myanmar. But I also think that from what I’ve heard, one of the reforms that will need to take place in universities here is to make sure that in all the departments there is the ability for universities and students to shape curriculums and to have access to information from everywhere around the world, and that it’s not just a narrow process of indoctrination. Because the best universities are ones that teach you how to think not what to think, right? A good education is not just knowing facts, although you need to know facts. You need to know that two plus two is four; it’s not five. That’s an important fact. But you also need to know how to ask questions, and how to critically analyze a problem, and how to be able to distinguish between fact and opinion, and how to compare two different ideas. And I think there’s a danger sometimes in countries that are — don’t have a long tradition of higher education to try to narrow the learning process, as opposed to open it up. And I think that that’s something that I’m sure university students here in Myanmar will want to express during the course of this transition period and the reforms that are taking place. PRESIDENT OBAMA: No, no, no, first of all, you can’t — I told you already that women aren’t going to get a chance to ask the next question. Where are you from? PRESIDENT OBAMA: I was just talking about you. Q Yes. And, yes, it gave me a little tear in my eyes. I thank you so much for putting us — making me as, like, one of the models maybe for what youth can do for change. PRESIDENT OBAMA: Good. So first of all, let’s just establish the science and the facts. The planet is getting warmer. The reason the planet is getting warmer is because human activity is releasing greenhouse gases that is trapping heat and increasing temperatures. And because you start getting a negative feedback loop, as it gets hotter, ice melts. The permafrost in places like Siberia start releasing methane gases. Ice packs in Greenland start melting. That then makes it even warmer. And we’re on a trajectory in which the temperatures could rise so high that it would have catastrophic impacts around the world because temperatures start changing, weather patterns shift. Traditional monsoon seasons might completely reverse themselves. Areas that once used to have arable land suddenly now have long droughts. Areas that used to be temperate suddenly get floods. We’re seeing the impacts in developed countries. We see it in my own country. And we’re seeing impacts in poor countries. And we’re seeing impacts, obviously, in island nations where if the temperatures continue to rise, we’ll end up with oceans that are two feet or three feet higher, and it could swallow up entire countries. So this is perhaps the central challenge, the most important challenge facing humanity in the 21st century, is getting control of this. Now, the good news is that we can begin to slow down that process so that the temperatures only go up a certain level, and although we’ll have to make some adaptations, it doesn’t become catastrophic. But in order to do that, we have to start transitioning our economies to clean energy rather than dirty energy. It means that we have to start developing wind power and solar power. It means that societies have to use energy more efficiently. It means that we have to find ways to use safe nuclear power because they don’t — that doesn’t emit greenhouse gases. So there’s no single answer. There’s a group of answers to the problem. And some of you may be aware that the United States and China are the two biggest emitters in the world. The United States had been the biggest emitter; China overtook us. In fairness to China, each individual Chinese person probably uses less energy and emits less greenhouse gases than an individual American. But there are a lot more Chinese than there are Americans. And if, as China continues to develop, they start matching the United States in how much carbon they release, we’ll never survive. None of us. Same is true with India — just because of the size of its population. And the same is true with Southeast Asia, which, as I said before, contains one out of every 10 people in the world. So all of us are going to have to be a part of this. And the United States and China — in a meeting with President Xi — we announced that we are both going to set bold targets for greenhouse gas reductions from 2020 forward. What we’re encouraging ASEAN to do, individual ASEAN countries, is also to come up with goals for how they are going to reduce their greenhouse gas emissions. And if all countries around the world put forward ambitious goals at a Paris conference that we’re going to be having in 2015, then this can serve at the basis for collective action in reducing greenhouse gases. But although we know what we need to do, the transition will be difficult because — just to give you one example — Indonesia. PRESIDENT OBAMA: You might not want to cheer about this — has been cutting down its forests at a very high rate in order to accommodate the palm oil industry. Now the palm oil industry is very lucrative, and you have some very big landholders and big companies who are making a lot of money from the palm oil industry. And they create some jobs. But when you just deforest entire sections of Sumatra or Borneo, that can end up having a devastating effect on the climate. There are countries in ASEAN that subsidize energy. Now, oftentimes this is with the best of intentions. The idea would be we want to make gasoline cheaper or electricity cheaper so that poor people can afford it. The problem is that when you subsidize energy, there’s no incentive to use less energy. So typically when you have a lot of fuel subsidies, those economies are very inefficient in how they use energy, and they generate more pollution. The countries that are most efficient in energy use, not only do they not subsidize energy — in fact, they tax energy use. So you look like — in a country like Norway, which produces a lot of oil, but gasoline there is still $6 or $7 a gallon, which in liters — who wants to do a liter conversion for me? Anyway, it’s very expensive. So part of what we hope each country in ASEAN commits to is to take the steps that will be required to reduce or at least slow the growth of its carbon emissions, and then slowly start reducing them. And it doesn’t have to be overnight, but the transition has to begin. So if you look at a country like Indonesia, making a commitment to reduce deforestation, reduce and eventually end fuel subsidies, those two things alone could probably help Indonesia meet a very bold carbon reduction goal. In the United States, I’ve instructed my Environmental Protection Agency to regulate the amount of greenhouse gases that power plants can send into the atmosphere. And we’ve doubled fuel-efficiency standards on cars. So in a few years, by the middle of the next century, by 2025, you won’t be able to sell a car in the United States unless it is delivering twice as much mileage for every gallon of gas. And so you can build in transition times to get this done. But we have to start now. And this is probably a good place for me to end by just saying that the issue of climate change is a perfect example of why young people have to lead. Because old people, they’ve created a mess, and then they’ll be gone. And then you — (applause) — you’re the ones who have to deal with it. And also what happens is old people get set in their ways. So the older you get, the more likely you are to say, that’s how it’s always been so that’s how I’m going to keep on doing it — even if there’s a better way to do things. Young people, they’re asking, well, why do I have to do it that way? Let’s try it this way. And that kind of willingness to accept challenges and try things in a new way, to not be stuck in the past, or to look towards the future, that’s what all of you represent. So I’m hopeful that you have a chance to participate in our Young Southeast Asian Leaders Initiative Fellows Program. Maybe I’ll see some of you in the United States. I’m sure all of you are going to do great things. And I hope all of you dream big and then work hard to achieve those dreams.